We gathered our top chefs, mixologists, and event planners for their tips to pulling off an unforgettable dining experience. The perfect pop-up starts with a little inspiration and lot of planning. List and rank the goals for your event. For a first-time event, you may just be looking to build your following and be happy breaking even. Knowing your objectives will help you decide the pricing and format of your pop-up. Over-planning is key. A pop-up is like opening a new restaurant every night; something is going to go wrong that you didn’t predict — an oven won’t work, or a piece of equipment won’t be there. You just need to be creative (and calm), to find a solution. The more scenarios you've planned for, the more easily you'll be able to deal with the unexpected. Predicting accurate financial projections and netting a worthwhile profit are the greatest challenges of a pop-up shop. In the beginning, strive to break even. Surround yourself with believers. Stay driven and passionate. Work toward making your experience better. Never hesitate to charge top dollar if you know you’re delivering. Then adjust your pricing based on market demand and feedback. Decide how many people you’re comfortable serving and the basic format for your event. Will it be a seated dinner? Do you want multiple turns? Do you want banquet or restaurant-style seating? 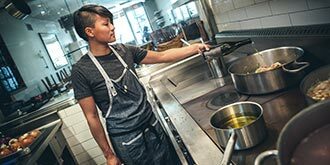 A prix-fixe or à-la-carte menu? BYOB or beverage pairings? Restaurant-style service requires a ticket system, and more coordination between front and back of house. Consider a banquet-style event, allowing your diners to meet new people and share in that communal experience. This format is easier on the staff, and allows them to work assembly-style. Opt for a pre-fixe, no substitutions, seated dinner — you’ll know exactly how much food you’ll need to prep and it will streamline service the night of the event. Accommodating special requests adds an extra layer of complication that will slow down service for everyone. Decide if your event will have a theme or focus on a specific set of ingredients. Keep a running list of dish and event ideas in a Google doc, pick out things that sound interesting, and try them out as you narrow in on your event concept. Make sure to have your idea in mind first, and fit your space to the theme rather than the other way around; otherwise you’re boxing yourself in creatively. Sometimes a great opportunity will present itself to you, but it will require flexibility and spontaneity. Other times, opportunity is a strategically planned affair. If you love being creative, keeping yourself open to this kind of variety can keep you fresh. 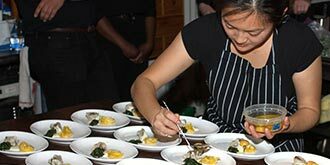 Watch Chef Melissa King’s pop-up come to life on Eventbrite. 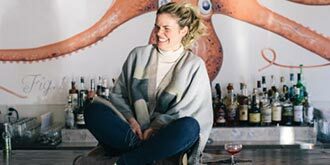 Consider teaming up with someone who will complement your food and help you reach a new audience—whether it’s another chef, an alcohol partner, or a local artist. Approach each collaboration as a partnership rather than simply asking for donations, sharing your promotion plan and making it clear what you’ll need from them to participate. By setting your ticket price and selling tickets online ahead of time, you’ll know your working budget for the event. Use the pop-up toolkit to stay organized and keep track of your costs. Because the venue cost for pop-ups is always so high, it’s important to look closely at food and labor costs as you build your budget. We try to keep our food cost around 25% of your budget, and labor around that number too. Build out a simple financial model and timeline for the major events that need to be completed before the day of. This will save a ton of time and headache in the weeks leading up to the event, and you’ll have a guide for your future events. Find a fun and functional spot to fit your concept and budget. The most cost-effective way to find a venue is the old-fashioned way: network with other chefs in your city and attend different pop-ups and events. You’ll meet people who know of a venue or can lend a helping hand. Find restaurants that are sitting empty during certain periods of the day. 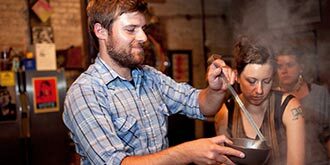 Explore coffee shops if you can prep off-site, or if you are doing an event like a dessert tasting or cocktail event that doesn’t require an industrial kitchen. 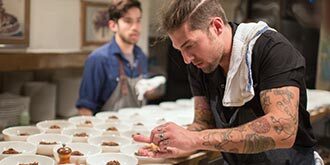 The food community is so accommodating and collaborative; all chefs have gotten where they are because of the people that have mentored and helped them. When approaching a potential venue owner, emphasize how you’ll promote their restaurant in your marketing. Services like Storefront and Peerspace are another way to find venues that are open to pop-up shops and dining events. If you go this route, make sure you ask for a fixed cost rather than an hourly rate. You’ll need a lot of time at the venue to set up, and hours will accumulate quickly. You really need your venue to be a fixed cost so you can accurately price your meal. If it doesn’t include rentals, I try to keep venue costs at 10% of our total revenue stream. Do the research ahead of time and be comfortable with the level of compliance you’re able to take on. If you’re using a restaurant space, make sure their permit transfers to you for an event. For outdoor spaces, look at parks and local city regulations to see what kind of permitting is needed. . Always get liquor liability insurance and event insurance so you aren’t held liable after the guests leave your event. Build your A-team for the big day. Once you lock in your venue, make a list of what your venue has, and check that against the list of what you need for the day of your event. Take your list of rental needs and shop that list around for a quote. When taking inventory at your venue, don’t forget the little things like garbage cans and liners, waiter trays, and a bus station. Get a full list of the additional surcharges and delivery fees from your rental provider. Ask up front about drop-off and pick-up times, and make sure their schedule works for your venue. Disposable is your friend! We use plastic glasses for our cocktail hour which saves us money on additional rentals—and time that we’d be cleaning all that extra glassware. Whether you go the agency route, find staff through your network, or recruit volunteers, having a staff you trust is critical. A trained staff can help with any issues that come up during the event, and will save you a lot of headache if you plan to do more. Finding staff that already works together is ideal. If you can keep the same staff for multiple events, you can invest in the training up front and they will know the ins and outs of your event. If you go with an agency, they will ensure you have all the necessary licenses and paperwork, but they’re typically more expensive, and you can’t pick your staff or train them until the day of. If you do go this route, it’s worth paying extra to find a reputable agency. You need more time than you think to train for the first time, so budget at least 3 hours for this. And don’t forget to hire a dishwasher! Either that, or be prepared to add an extra 3 hours to the end of your night. Give your friends and fans the opportunity to volunteer. Have a way for volunteers to submit their email on your site—or include a volunteer link in your email—and set up a separate event page with different tasks and time slots that volunteers can register for. Keep a separate mailing list of volunteers that you regularly update with opportunities. We've found it’s a great experience for folks to see behind the scenes for a night. Remember that your volunteers are generally not professional cooks, so give them really focused, discrete tasks, and don’t assume they can do something unless you've shown them how. Volunteers are donating their time, so make sure to tip them, feed them, and publicly say thank you. Create a page that captures the personality of your pop-up. Write a compelling, SEO-optimized event description for your page that reflects your personality and cooking style. Let the public know about your culinary chops, and include a menu—even if it’s tentative. Need more help? Check out this article on how to craft a great page. Paint a picture. Make it funky. Or weird. Anything that will stand out and speak authentically towards your concept. Your page is the first impression you’ll make on your potential guests, and they’ll judge your creativity and capabilities accordingly; So show them what you’ve got! A lot of SEO value is based on having relevant keywords in your event title and and on your event page. In addition to giving your event a short and catchy name, include at least a word or two in the title and description that could be used to search for your event. We used a custom question to ask people in the Eventbrite registration flow what their favorite song was, and we incorporated them into a playlist for the night of. You can also ask who else is in their party so there are no seating chart surprises. Thoughtful details make the guests feel like they are part of something special. Pre-paid ticketing makes the dining experience more relaxed and enjoyable for guests, and they're willing to pay a premium for the peace of mind. Make your event page live and watch the ticket sales roll in. Provide opportunities for guests to purchase add-ons like beverage pairings or a seat at the chef’s table to deliver a premium experience, while helping you maximize revenue. After trying many different styles of timing, I’ve settled on going live with all my events three weeks prior to the actual date. It’s far out enough for most folks to not have plans yet, but close enough to push hard and promote it every day. Ready to set up your page? Turn on the waitlist feature — If your event sells out, you can still capture people’s information for your email list to let them know about your next event. It’s time to let the world know about your event. Now that your page is up, it’s time to get the word out about your pop-up. Eventbrite’s Mailchimp integration allows you to upload your contact database or send invitations to attendees of a past event. You can also create beautifully designed invitations and pages with the help of the 99 Designs and Event Kingdom tools in your Eventbrite dashboard. Invest in well-designed assets and a cohesive theme. This may be your first touchpoint with diners and it’s reflection of your brand. We try to only send newsletters when there is something major to announce, like tickets going on-sale for an event. This trains people to know that your emails are worth opening. For us, sending out emails around 11 am on weekdays—when people are winding down from the morning, and starting to take a break mentally for lunch—has been really successful. Your invitation should include a clear call to action that links to your ticketing page. Design the announcement to be short and succinct, as people are more likely to read and absorb shorter messages. We always include the menu in the email that goes out, and I try to write it in a way that people can really imagine the experience. Minimal menu descriptions work at a restaurant because people are already there and just need to choose, but in this case, you need to convince people to pay for something that they don’t know anything about. Enable social sharing on your event page so guests can easily share your event with friends. We’ve found that on average, each Facebook share about your event leads to an additional $4.15 in sales. Create a short and sweet event hashtag, and encourage guests to share photos with your hashtag by including it in your email invitation and on your menu at the event. The best windows for me to post are 8 am -10 am and 5 pm - 7 pm when people are commuting to work. Anything 9 pm or after gets a good amount of traffic too, while dinnertime tends to get less engagement. Make sure you hashtag or tag the partners in your event so they share with their followers. Post event teasers on social media several times (no more than 3-4) leading up to the event, and consider paying to “boost” the post to extend your coverage to a wider audience. During the event itself, snap photos to post on your social media platforms, and encourage attendees to do so as well. Just one great write-up can get people talking about your event. For more press tips, check out this article on how to build buzz and boost attendance for your event from Blue Hominy PR. Send individual emails to each journalist or tipline letting them know that your event is coming up, in case it fits into any stories they’re working on. Cast a wide net, but do your research in advance to determine whether your story seems like it could be relevant to something that journalist has covered before. Many journalists request imagery to run with their story, be sure to also have high-resolution photos on file. Save a few tickets to comp and invite press to your event. Face them towards the kitchen if possible. Even if they don’t write about you this time around, you’re building a relationship for the future. Have a press page on your site with logos and press hits you’ve received. Interested reporters will want to see who else has written about you. Use the stats from your Eventbrite dashboard when pitching and inviting press: reporting high traffic and share numbers to your page really shows the demand for your event. Rise and shine, it’s time for all of your hard work to pay off. If your venue will allow it, drop off all your equipment the night before, so you’re ready to go in the morning. Have materials prepared for your staff so everything goes smoothly. Have an operations plan for the front of house and back of house on the day of; send it to staff beforehand so they have time to review and get familiar with it. Go through every single dish with your staff and the equipment needed, ideally with images of what the final product will look like. When service starts, I always do the first plate and demo. ’ll put on music right when we arrive to set-up – It immediately elevates the mood. During the event you want a playlist that’s upbeat, but not distracting. We use an Indie Songza playlist, which works well because the songs are pleasant, but not the focal point. You want people to feel like they're walking into a really special, secret place. Lighting and tables are really important. They're coming to your pop-up rather than going to a restaurant because they want to have a unique experience, so its important to give that to them. From the time they arrive to the time they leave, you want your guests’ experience to be top-notch. Diners are coming to your event for the opportunity to engage with you, so find small ways to elevate their experience and interact with the guests. It’s important to have someone dedicated to check-in to make sure that people are greeted, feel comfortable, and know what to do. If possible, assign a crowd-watcher, who can keep an eye out for guests that aren’t having a great time, and can address their needs and intercept issues. 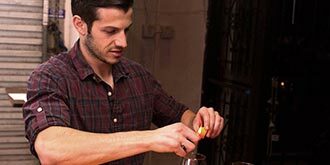 Strategically plan when you pour: Pour the first glass immediately! It never hurts to give guests a little alcohol right away. Provide gifts from the chefs throughout the meal so that you’re constantly surprising people the whole way through. Make sure someone, ideally the chef, is introducing the dishes. I like to say up front that we’ll be interrupting conversation to talk about the dishes so they have that expectation and know to quiet down. People appreciate the food and have much stronger feelings towards it when they know the story behind the dish. Your job doesn’t end when the event does. After thanking your staff publicly and doing a tip call, talk to each guest that’s still around and give them a way to connect with you after the event. Have extra menus on hand to offer as a memento, and consider a to-go treat like a scone for their breakfast with a personalized note. Give people the opportunity to ask questions, and don’t kick them out—let them them stick around as long as they want. If the kitchen staff is drinking beers in the back, let them hang out and drink a celebratory beer with you. Get in front of your guests for some valuable face time. Forget about cleanup for thirty minutes and just be in the moment. Exchange contact info. Follow people on social media. These folks that you’re getting to know are your fans, and because you gave them the time of day, they’ll be at your next pop-up—with friends. Understand the disposal rules with your venue and the regulations in your state regarding disposal of trash and recycling; you can be fined if it’s left on the curb. Know ahead of time how your staff prefers to be paid, and make sure they’re paid either before or immediately after the event. Follow up within 1-2 days to say thank you to your guests, send photos, and ask how things were. Sometimes people feel awkward about giving feedback. We send out a link to sayat.me, a simple to use anonymous feedback tool. To help you out, Matt and Jenny from the pop-up supper club “I Forgot It’s Wednesday” have shared their toolkit, from their planning checklist to their day-of playlist. A plug-and-play model to track your finances and budget. A sample timeline of everything you need to execute to make your pop-up a success. A sample front of house and back of house day-of ops plan. A tried and true playlist for your next event. Check out our study on the rise of pop-up dining. Free food and beverage event resources, tips, and articles. Ready to Host Your Own Pop-Up? Now that you’re a pop-up pro, it's time to set up your event page. Don’t worry, we’re in it together! Eventbrite has your back with endless tips and tutorials.